The V Bar V Heritage Site is located in an area of the Coconino National Forest near Camp Verde, Arizona. The V-V became a Heritage Site when through a land swap in 1994 the area fell under the management of the National Forest Service. After several years of study and preparation the site was opened to the public in 1996. The V Bar V Heritage Site now protects an extensive collection of Beaver Creek style Southern Sinagua petroglyphs. 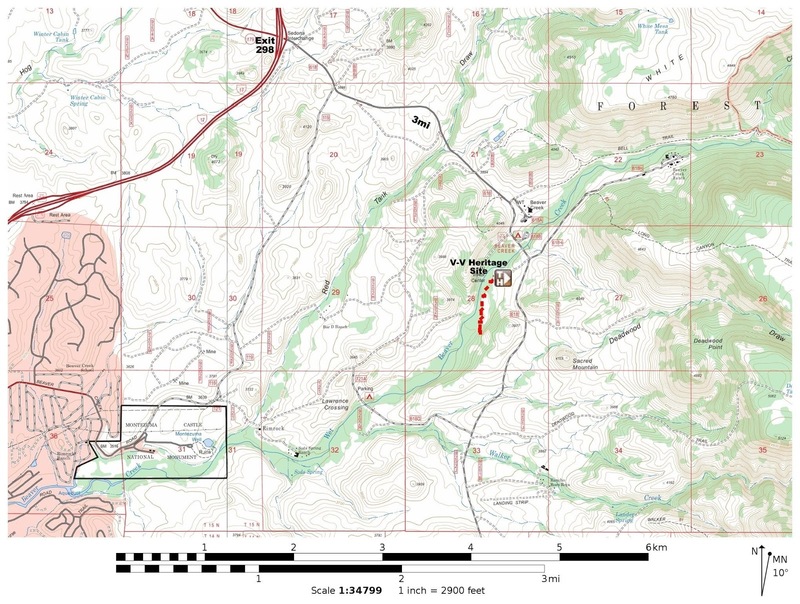 The trailhead is located about 2.8 miles east of the I-17 and Highway 179 interchange north of Camp Verde. From the exit off the interstate travel east on Forest Road 618. The parking area is to the right about a half mile past the Beaver Creek Campground. It is also possible to follow Forest Road 119 from Montezuma Well if your plans also include stopping there but unless the gravel road has been recently bladed the washboards may be so bad that the interstate would be much smoother and faster. Follow the wide path from the parking area down to the Visitor Center. The Visitor Center has a small gift shop and a few nice displays of artifacts. The rangers and volunteers are very helpful with any questions you might have. There is also a restroom with running water at the Visitor Center. A newly constructed vault toilet is located near the petroglyph panels at the end of the trail. A single chimney is all that is left of the former ranch house. A few other remains of the once thriving ranch can also be spotted in the area. From the Visitor Center the trail follows along the creek to the petroglyph panels. The hard packed trail is wide enough and smooth enough for a wheelchair but the change in the elevation of the trail might have kept it from getting an ADA rating. Baby strollers should have no problem at all managing the path. Studies of the site reveal 4 main panels that are covered with a total of 1,032 individual petroglyphs. Researchers have identified enough unique features of the panels to place them in a group called the Beaver Creek Style. Even though they are part of a unique style most elements have many similarities with other sites throughout the southwest to suggest a common method of written communication that could be understood even by those speaking different languages. A solar calendar is also incorporated into the panels by taking advantage of the gap in the cliff to the right and several stones that have been placed in one of the crevices. A sun dagger lines up with certain symbols to mark the passing of both the summer and winter solstices and the spring and fall equinoxes. Such calendars were vitally important for not only the timing of planting and harvesting but also for the timing of religious ceremonies for the blessings of moisture for crops and other necessities of life. The concentric circle petroglyphs are among the components of the solar calendar. Some of these panels are so densely populated with symbols that it may have been a challenging read even for those who knew how to interpret them. 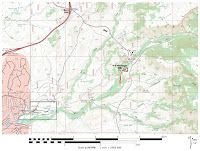 The Verde Valley area is very densely populated with archaeology sites. Some of the most popular places to visit in the area are the Montezuma Castle, Montezuma Well and Tuzigoot National Monuments. Also of interest near the close by town of Sedona are the Honanki Ruins and the Palatki Ruins which are also Heritage Sites. All of these sites can be visited on a two day outing or in one very long day. If you would like to see them for yourself then all you have to do is 'Take a hike'.